The largest party boat fleet in New Jersey is located right here in Belmar. This is a great way to experience fishing in the Atlantic Ocean, even if you’ve never fished before in your life. Sit back and enjoy the ride, and let the expert captains and crews take you to the best fishing spots. The privately own boats are ready to head to sea almost every single day of the year. Each company sets their own prices, which vary depending on factors like the length of time and the type of boat. Each boat offers food, drinks, and fishing equipment rentals. The captains also log fishing reports on their websites to keep customers informed on weather and fishing conditions on a daily basis. Big Mohawk bigmohawk.com – Captain Chris Hueth prides himself on being the first party boat out each morning. The Big Mohawk offers private evening charters, sunset cruises, and scattering of ashes at sea ceremonies. Captain Cal II captaincal2.com – Captain Ron has more than 30 years of boating and fishing experience, and he uses his know how to find fluke, sea bass, blackfish, bluefish, porgies, ling and others. The boat is also available for bachelor and bachelorette parties, family reunions, company outings, and fireworks cruises. Golden Eagle goldeneaglefishing.com – Captain Rich Falcone and his crew offer morning trips from 7:30-2:30 for $65 per adult and $45 for children under 14. Seniors are $55. Afternoon fishing and sunset cruises are $50 for adults and $35 for children. The Golden Eagle also offers overnight tuna trips starting at $340 for an adult and nighttime fishing trips to catch bluefish. Tropical Adventure jimhullsportfishing.com – Captain Jim Hull runs the new 80-foot Suzie Girl, which carries up to 100 passengers. With the two engines combining for 1,400 horsepower, Suzie Girl is the fastest of her size with a cruising speed of 20 knots. Hull offers all types of fishing, including day, night, overnight, inshore and offshore. Miss Belmar Princess missbelmar.com – Captains Alan Shinn and Lenny Forsyth have a combined 76 years of experience between them. They have two boats, the Miss Belmar Princess and the Royal Miss Belmar. Their larger ship, the Miss Belmar Princess is 120 feet long with 2,100 horsepower. It is the fastest party boat in New Jersey, according to the captains. They offer ¾ day trips and sunset cruises. The cost of the day trip is $65 for adults, $55 for seniors, and $45 for children. Sunset cruises are $50 for adults, $45 for seniors, and $35 for children. Ocean Explorer oceanexplorer.com – Captain Bobby Quinn has more than 30 years of experiencing helping customers from all over the world catch fish. 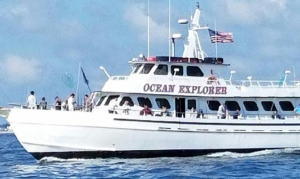 The Ocean Explorer prides itself on fishing all day every day, rain or shine. Daily trips from 7:30 a.m. to 3:30 p.m. are $70 for adults, $65 for seniors, and $40 for children.